Fearless international skateboarders will go head to head with the Kiwi warriors for Vans BOWL-A-RAMA Wellington, Saturday 16th February from 11am at Wellington’s Waitangi Park. The hugely popular week of skateboarding infused culture known as ‘Festival of the Skateboard’, celebrated on Thursday night (14th Feb) the 15 Years of Manual Magazine Presents: 2012 New Zealand Skater of the Year Awards Party. Friday night the LOVE+GUTS art show will attempt to pay homage to the attitude and style of “The Badlands” which has been a major influence on skateboard culture for more than 35 years. It is this influence you can see on the skaters in this exhibition both on and off their boards. The week will exhibit some of the world’s best skaters, including Pedro Barros, Jack Fardell (new Australian Champion), Josh Rodriguez, Mike Owen, Kalani David, Charlie Blair, Lizzie Amanto, Otavio Neto, Josh Stafford, Alex Sorgente, Nilo Pecanha, Kevin Kowalski, Nolan Monroe, Jackson Pilz and Jesse Noonan. In the Masters we have a killer line up including Sergie Ventura, Pat Ngoho, Lester Kasai, Sasha Steinhorst, Mike Spittlehouse, Steve Caballero and Mike Rogers. 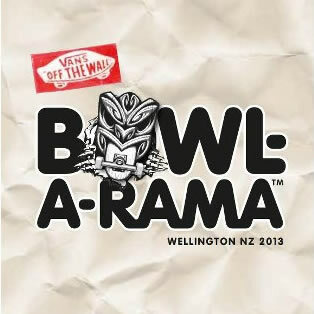 This is also the first year that Vans BOWL-A-RAMA™ Wellington will be live streaming from 11am on the BOWL-A-RAMA website – http://www.bowlarama.com.au/live. BOWL-A-RAMA™ was born on Bondi Beach – Sydney, Australia in 2005 and is the biggest professional concrete series in the World. With the addition of NYC, BOWL-A-RAMA™ can now call some of the most iconic destinations in the world home.